I know it may not seem like spring is near to anyone in living in the northeast or dealing with sub-zero temperatures right now, but March is right around the corner and quite frankly I’m sick and tired of hearing, seeing, or even talking about winter. I’m over it. So I’m focusing on a fresh new dose of spring trends to make the countdown to warmer weather seem that much more real. Here are the top five for a little springtime daydreaming. I love everything you picked! You totally hit all the trends. Love all these trends! 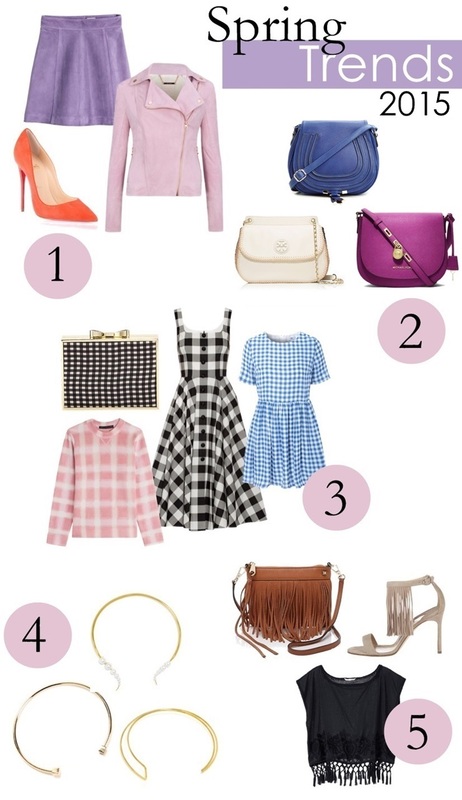 The gingham and the fringe are my faves! Those all look great! I think the gingham is my favorite. I think it's safe to say we are all totally over winter! Love the pink moto jacket... what could be a better way to kick off spring? Oh what great picks for spring! Those purses are sooo perfect for spring!